R Markdown is an amazing tool that allows you to blend bits of R code with ordinary text and produce well-formatted data analysis reports very quickly. You can export the final report in many formats like HTML, pdf or MS Words which makes it easy to share with others. And of course, you can modify or update it with fresh data very easily. 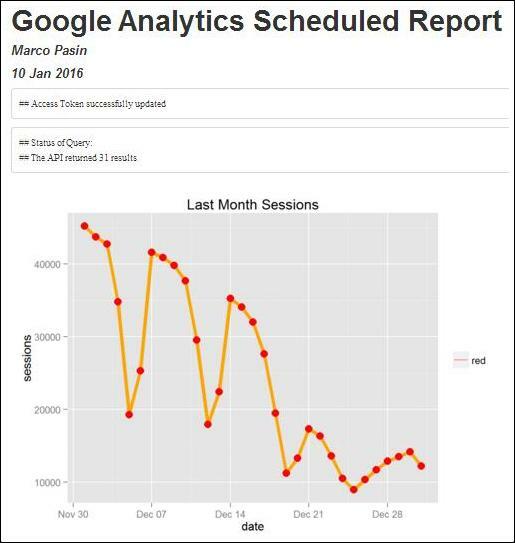 I have recently been using it R Markdown for pulling data from various data source such Google Analytics API and MySQL database, perform several operations on it (merging for example) and present the outputs with tables, visualizations and insights (text). But what about automating the whole report generation and emailing the final report as an attached document every month at a specific time? 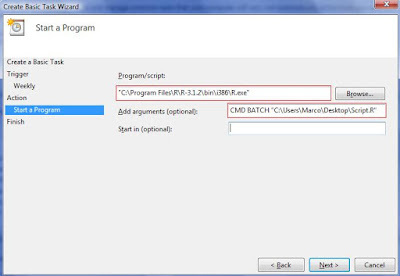 In this post I am going to explain how to do it in Windows. If you do a search on google, you will find several threads on stackoverflow and a few good specific posts on it. However it took me sometimes to get it working and had to try different options before. That's why I am writing this quick tutorial, including screenshots, hoping you might get it your report automated faster! A very basic report. Remember that in Rmarkdown you can decide whether to show each chunk of code or not. I showed just the final outputs that are the table and the bar chart. To email the report I have used the gmailR library which allows you to generate and send emails directly from R. To make sure the gmailR library will work, first you might need to enable the "Less Secure apps" option in your google account. Open your Google personal account and go to Sign-in and Security section, scrolll down to the bottom of the page and switch on the "Allow less secure apps". I also made a few tries with the mailR package but without success. I guess this was because of security issues with my google account, I have gmail. Anyway the gmailR package worked perfectly so I sticked to it! Here is the code contained into my R script, which is named "Script.R". 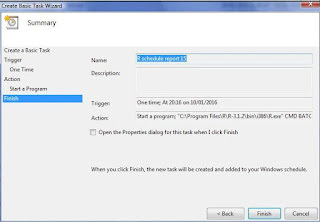 Click on Action>Create basic task. Type a name for your task and add a short description if you like. 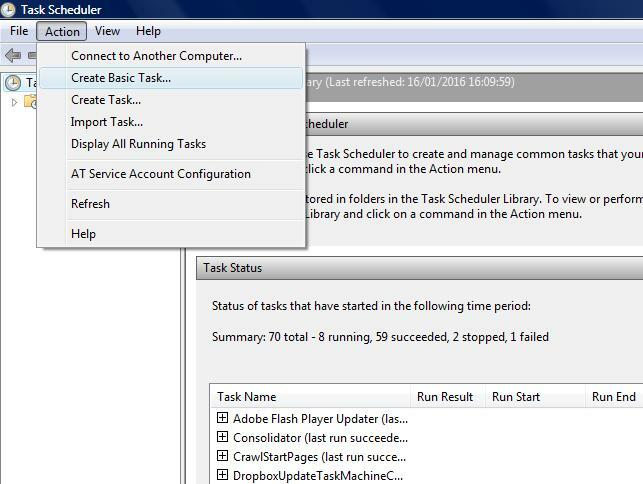 Now select the trigger which means how often you want the task to be executed (to try it first I recommend choosing "One time"). 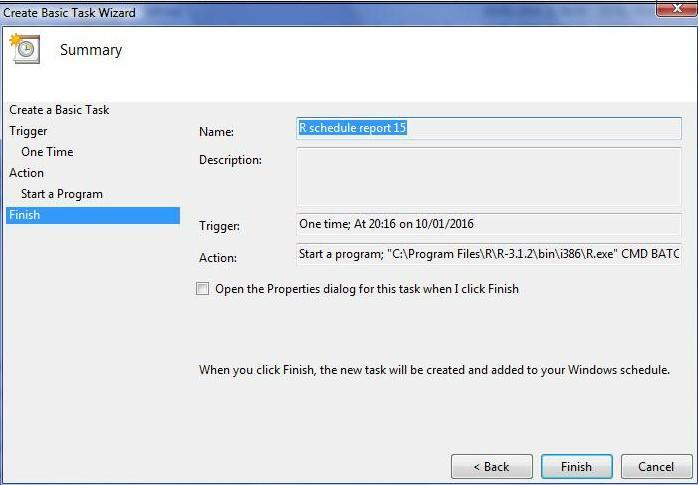 Select the date and time and on the action field choose "Start a program". >Add arguments: CMD BATCH followed by the path of the R script you created at step two. Remember to put the directories path between quotation marks "" like in the image below. Click on next and you should now reach the last step and see a confirmation window. Press finish and voila' your task is created and it should execute correctly at the time you set. 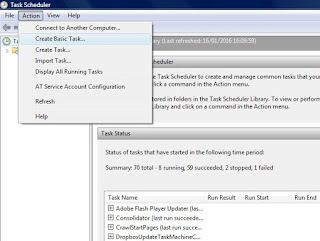 At the time you set the task you should see the "taskeng" window popping up and disappearing after a few seconds (depending the workload you placed on your R files). Now open the mail account where you sent the report to. Did you get the email with your report attached? As a general troubleshooting method, I also suggest opening your R console (double click on R.exe) and execute line by line the code of your R script at step 2. This way you can realize if there is an error inside your R code. I mean, Windows executes the task correcly but no data is generated/sent by R.
*To be able to send mails via gmailR package, make sure you enable the "less secured apps" option in your Google account. If you like to reproduce the whole process using my files, you can find them both the Rmarkdown report and the R script at this github repository. 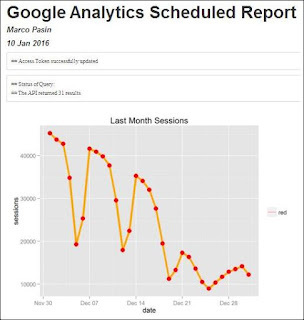 I hope the post was helpful and will push you to use R for generating business reports.